Philadelphia radio personality Lady B announced this week via her Facebook fan page that she would be back on the air very soon. "Okay, Okay family. Here is the news we've all been waiting for! I will be back on the air July 2nd!!!!!!!!!!!!!!!!! Old School 100.3fm Yeeeeeaaaaah Boyeeeeeeeeeeeee!!!" 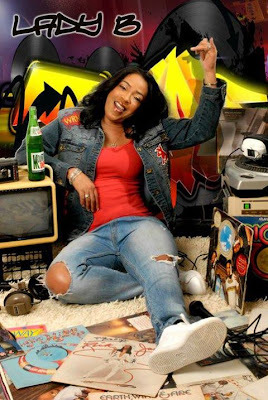 Lady B, who pioneered Hip Hop radio in Philly over 30 years ago and helped launched Sirius XM radio's Backspin channel, has transitioned into being an Urban AC personality over the last few years. However she was also able to convince her PD Elroy Smith to let her go outside the traditional Today's R&B format and play Old School Hip Hop on her WRNB program. She called her hour long segment The Afternoon Basement Party. It became popular among her listeners. It may have even sparked the idea among management that the station should change to an Old School format featuring R&B music as well, like some of the other Radio One, Inc., Urban Adult Contemporary stations across the country. 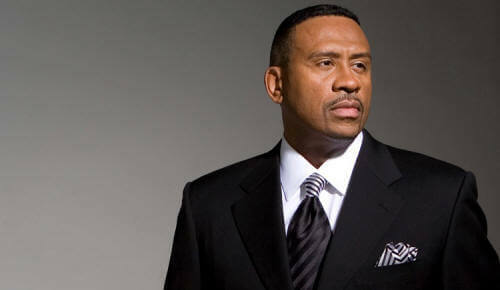 With the new format, WRNB has experienced a ratings bump since the change to an exclusive "Old School" music format. Most of the music featured is 70's and 80's R&B music (Earth, Wind, & Fire, Michael Jackson, Teena Marie, The Commodores, etc.) however the station occasionally drops into its rotation Naughty By Nature's "Hip Hop Hooray" and Rob Base's "It Takes Two." It was less than two years ago that WRNB made a frequency switch to a better signal from its old dial setting at 107.9, causing 100.3 The Beat to morph into Hot 107.9. Meanwhile Old School 100.3 increase has been to the detriment of heritage station and long time ratings winner 105.3 WDAS FM. The Clear Channel owned station has seen its ratings decrease from the number 3 most listened to radio station in Philadelphia to the number 6 rated position. There hasn't been a challenger to WDAS FM's throne in a number of years. Over the past 10 years or more the station has been somewhere in the top 3 during the PPM ratings era. Before Arbitron's electronic PPM system, WDAS was frequently the Number 1 rated station when the method of measuring radio listeners came about by having listeners record their listening habits into a monthly handwritten diary. It will be interesting to see if Old School 100.3 can maintain its current popularity among listeners or if WDAS will return to its familiar ratings leading position. While she has been off the air, Lady B has been making promotional appearances across the city on behalf of the station. With this announcement, Lady B will become the first daily on-air personality besides the Tom Joyner Morning Show on Old School 100.3. The only others live voice on the station has been weekend personality Dyana Williams and her co-host Derrick Sampson, who recently revived the weekly afternoon Sunday Showcase program a couple of weeks ago on the station, which was a part of the old WRNB format. Old School 100.3 along with its sister station Hot 107.9, recently presented their annual music industry forum event. 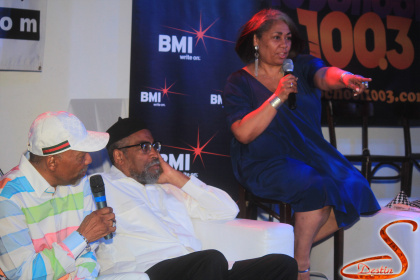 Among the participants were Philadelphia International Records founders and songwriters Kenny Gamble and Leon Huff. Much of Dyana Williams' program features the songs written and recorded by Gamble and Huff from the likes of Teddy Pendergrass to The Stylistics to Phyllis Hyman.